Here are some of the Awards that Tom's Nook Too has received. If you have enjoyed your visit to Tom's Nook Too, please nominate it for an award. Thank you. Your pages are truly outstanding!! You have put in a lot of work and it does show. In appreciation I am attaching my award for you. I'd send ya a PURPLE heart!!! You totally deserve it!!! I really am enjoying your page. Take care and keep up the good work!!!! 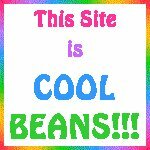 Your page is very interesting and has a wide variety of things to look into. Your pages have a friendly feel to them that makes people enjoy their visit with "you". That is a hard thing to do in a home page. 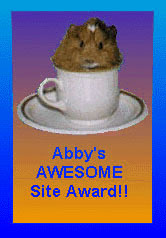 Abby and I agree that you deserve her Abby's Awesome Site Award for the fine work you've put into your pages. The Interplanetary Post Office has awarded you the "Great Northern Website Design Award". My way of saying that I enjoyed my visit to your page very much. It is my pleasure to inform you that your Personal Web Page has been awarded Kaptivations Web Designs EXCELLENT PERSONAL WEB PAGE award. Congratulations! Vision Scan has awarded your site the Lighthouse Award for Web Excellence! .... keep up the great work! Interesting concept... that "click on the sound to hear an appropriate message at the appropriate time" thing... nice site! Dear Thomas, Thank you so much for inviting us to your websites. They were all truly wonderful! We could tell how much time and love has gone into your sites.We are very honored to award all your sites with both our "Beautiful Site Award" and our "Golden Nugget Award"! "2002-2003 Golden Web Awards" Congratulations! TOM'S NOOK TOO has been reviewed and chosen to bear the 2002-2003 Golden Web Award. As a recipient of the prestigious Golden Web Award, you and Your Staff at TOM'S NOOK TOO have Obviously Worked Very Hard and deserve to Proudly Display Your Award. Tom's Nook is continually being Updated - Last update was on September 19, 2002 - Some of the NEW additions are the Newswire Service, the Thought for the day which is updated several times a week, and my Family Tree. With all the many links including free Postcards, there is sure to be something for every visitor. E-mail me with your comments, or better still, please read and sign my Dream book. Return often for a visit as I am continually updating. Thank you. If you like it tell your friends about it. If not, please let me know. Thank you for visiting.